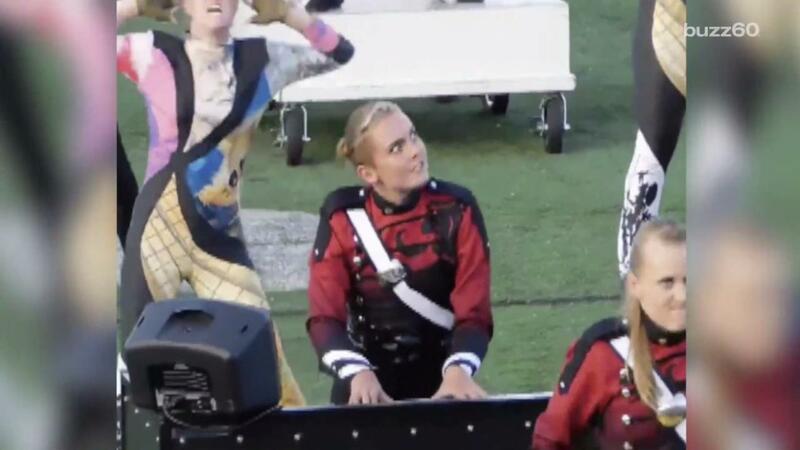 A keyboard player from the Boston Crusaders Drum and Bugle Corps is going viral after a rather intense performance was captured on film and posted to Facebook, causing a social media uproar. Since it was posted, the video has racked up nearly 300,000 views and multiple comments by people speculating that the keyboarder looks crazy -- or even possessed. "Was that part of the show, to look a little crazed," one woman inquired. One man jumped in to explain that, indeed, it was part of the performance to look insane. According to John Clougher, the performance piece was inspired by a story of a man losing his sanity. "Authored by Miguel de Cervantes, the novel takes the readers through the adventures of Mr. Alonso Quixano," he wrote. "Quixano reads so many books he loses his sanity, re-imagines himself as "Don Quixote," and sets out to revive chivalry and bring justice to the world." Naturally, the video made its way to Reddit in the form of a gif, where someone claiming to be the girl's brother left a comment, saying what a dream come true this whole experience has been for his sister. As if that comment was really necessary ... if there was one thing we didn't doubt after watching that performance, it was her love for band.